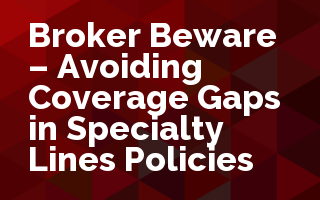 Consistent with best practices, Specialty Lines Insurance products, such as Director & Officer liability, Employment Practice Liability, Cyber Liability and various forms of professional liability, all give rise to “Broker Beware” situations. Every day, new Appellate decisions are creating liability over the language used in policies, the failure to catch innocuous language, and the failure to properly cover hazards specific to a particular type of risk. This webinar will delve into the decisions that have come down over the past two years creating additional liability for insurance brokers, especially those who “specialize” or sell Specialty Lines products. As a result, you will learn how to avoid an E&O claim by not properly covering the Hazards of faced by your customers.